With the splender of an Alpine backdrop the allies discovered Me 262’s hastily abandoned at the Wars end. 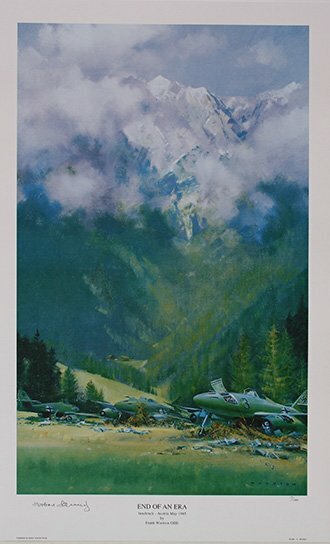 This stunning print is signed by Leutnant Norbert Hannig who first flew with JG54 on the Eastern front and at the wars end he was flying the legendary Me 262’s with JG7 and JV44. His final victory tally was 42 aircraft destroyed.